Written June 2nd, 2016 — Developer Updates | New Homes. Mattamy Homes Heritage has just a handful of single family home lots remaining in their inventory at Marley Park, including one quick move-in home (pictured) and two model homes – a rare opportunity in this charming neighborhood. Known for their remarkable quality and attentive customer service, Mattamy Homes has been building new homes in Marley Park since its grand opening in 2005. 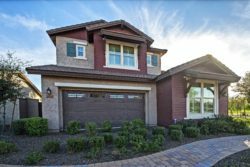 The remaining, new single-family homes offer spacious great rooms, three- and four-bedrooms with two- and three-baths and two-car garages. It is a rare opportunity to live in a former model home. Even better to live in one in Marley Park. Located on a corner lot directly adjacent to Founders Park, this beautiful 3,524 sq. ft. Mattamy Waterford model home is available for quick move-in. With 5 bedrooms plus a loft, 4.5 bathrooms and a 3-car garage, this home features a casita with separate entrance and full bath. The kitchen is gorgeous with staggered custom white cabinets, granite countertops, decorative backsplash, upgraded stainless steel appliances, butler’s pantry and wet bar sink. The carpet and tile have been upgraded throughout. Other features include an iron stair rail with cherry stain, two-tone interior paint, gas fireplace in family room, paver porch, covered patio, private pool with water feature, 2×6 construction, and so much more! There’s no questions that Marley Park homes are beautiful. But more than a home, Marley Park is a picturesque neighborhood that offers residents one-of-a-kind amenities including the Heritage Club and Pool House, over 15 uniquely themed neighborhood parks connected by an Arbor Walk, an elementary school and several signature community events that take place throughout the year. Residents also enjoy Marley Park Plaza, a 13-acre mixed-use marketplace with convenient shopping around the corner. For more information about Mattamy Homes Heritage, contact them today at (623) 215-2550. For more information about this Quick Move-In Home, contact Sales Counselor or Fred Fowles at (602)-751-3465.